A few days ago my neighbor Ellen told me that she had a “pie recipient” for me. She told me her name was Ava and that she was a very gracious and generous person. Not long ago, Ellen felt she needed to relinquish some of her duties at the Ashland Food Bank, and Ava stepped up to assume them. Ellen said that this was not unusual because Ava is really a special lady, always willing to offer help when someone needs it. When I asked Ellen what kind of pie Ava might like she suggested a quiche because a) she works full-time, b) she volunteers at the food bank, and c) she is expecting her first child! Having dinner ready in the fridge may come in handy for one so busy. With that in mind, I began my day today by roasting the vegetables for a quiche for Ava. This afternoon, I was unable to reach Ava by phone. Finally, I decided to bring the quiche to Ava at her workplace but unfortunately she was out of her office at the time. 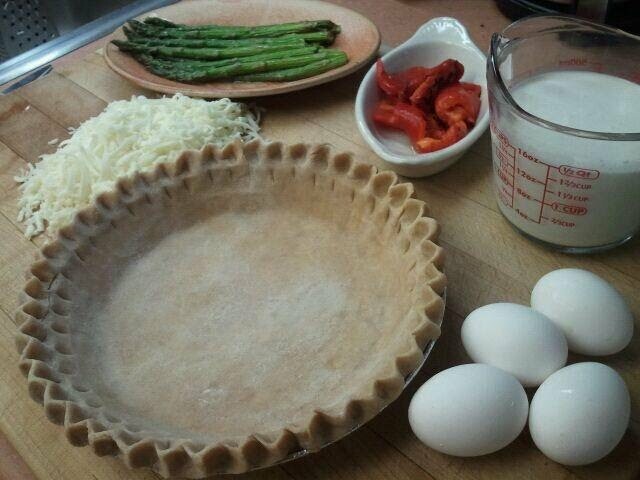 However, a short while later Ava called to thank me for the quiche and said she planned on sharing it with others. It sounds just like something she would do. Ava, thank you for all you do… and I wish you and your baby all the best!